Quick editor’s note: our team came back from Italy full of inspiration. 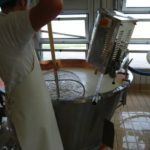 This is the first in a series about our experiences and insights on our Italian adventures, findings, cheese and more. Take it away, Andrew! My journey to the Italian countryside, somewhere between Reggio Emilia and Parma, began 4 years ago. 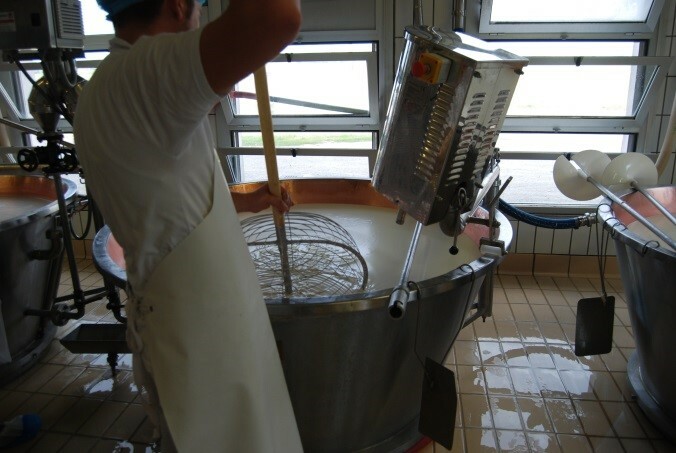 Before any of the aging, gorgeous wheels of Parmigiano Reggiano had begun their life as milk, before the cows had eaten the lush grasses growing nearby, before Riccio and his team heated the milk, added the rennet and salt, cut the curds, formed the wheels and then brined them. My journey began before all of that, in a dimly lit conference room upstairs at Murray’s HQ, with a dozen of my coworkers. 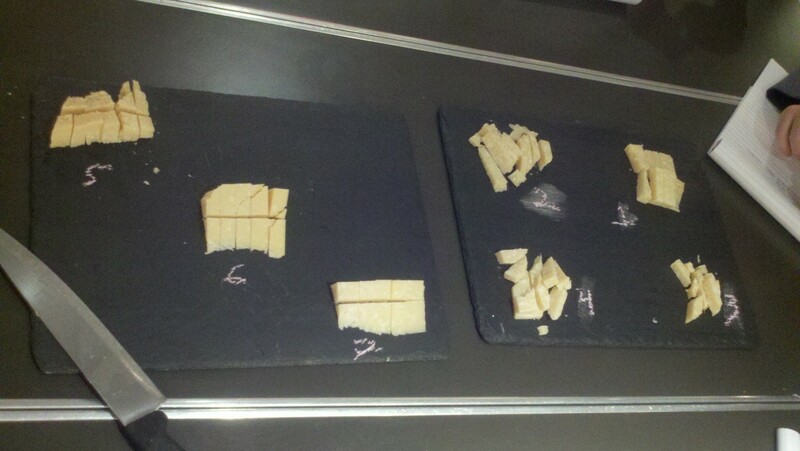 On that afternoon four years ago, as we filed into the room, over thirty different plates of Parmigiano Reggiano were arrayed across the room and we were given simple instructions: pick the best one. Parmigiano Reggiano, the King of Cheese, is PDO, or protected designation of origin. That means that any Italian cheese maker who makes it, must follow the same recipe and they must live within a very specific geographic area. 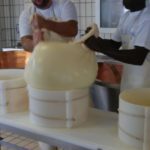 With aged cheeses, the goal is to get as much moisture out of the curds as possible so that the aging process goes smoothly and without spoiling. There are multiple different ways to remove moisture from curds: salt, heat, and cutting the curds. The salt works through osmosis, pulling liquid out of the curds while adding salt back into them. The heat causes evaporation. Cutting the curds smaller and smaller removes any pockets that moisture could hide in. 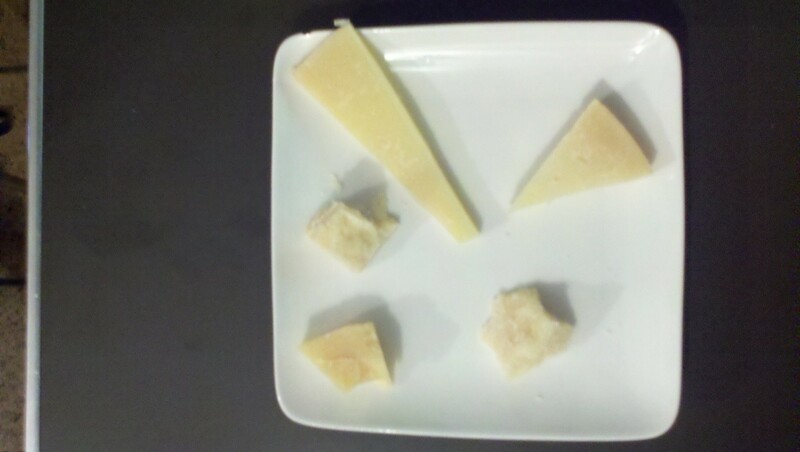 In making Parmigiano Reggiano, they do all three. It starts with combining skimmed milk from the previous evening with whole milk from the morning milking. 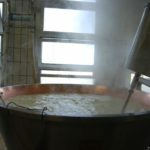 From there, the new partially-skimmed milk gets pumped into giant copper vats where it is heated, rennet is added, the milk becomes curds and whey, the curds are cut, the vat is heated, and then the curds are hooped together. No cheese maker who makes PDO Parmigiano Reggiano can do this differently and that’s what guarantees consistency when you buy Parmigiano Reggiano at your local market. Why go through this exercise 4 years ago? Shouldn’t they all taste the same? Yes and no. 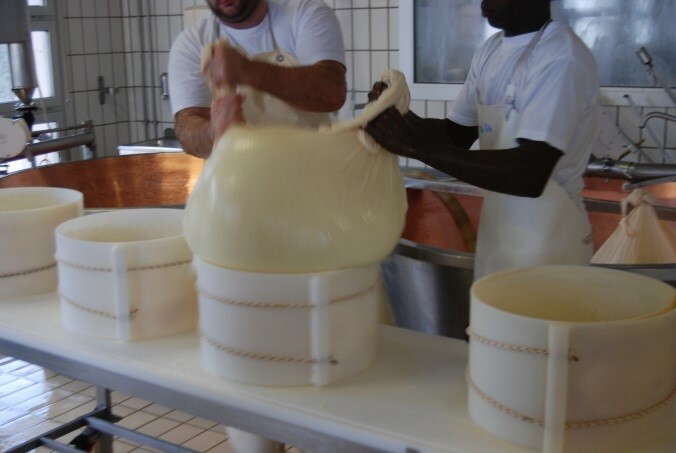 The PDO helps to guarantee that the cheese you are getting conforms to certain requirements, but there are other factors at play in cheese making. 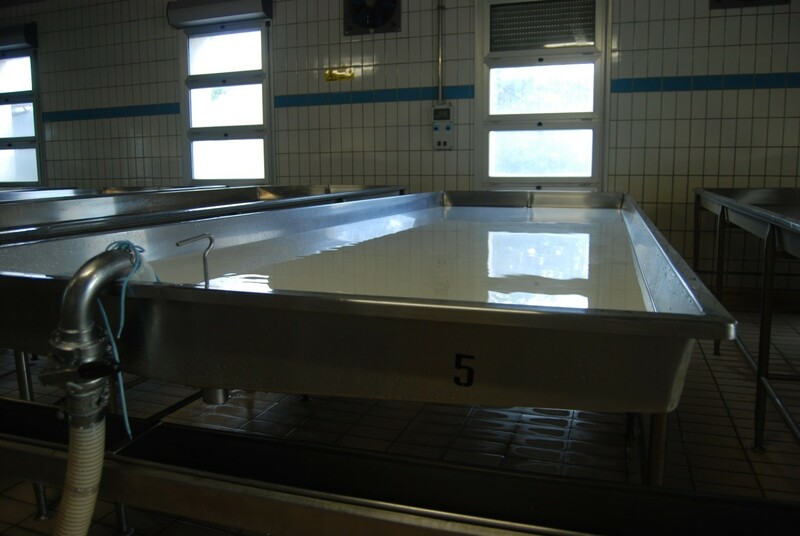 The specific feed of the cows, minuscule variations in temperature and time between cheese makers and in the aging process, and where the cows are in their reproductive cycle . All of these pieces, when put together, can lead to dramatic differences. So we tasted through the 30 different options, and we narrowed it down. And then a few months later, we did it again. By repeating the tasting, we got to try wheels from different parts of the year and slightly different ages. We tasted wheels that tended towards the nuttier side, we tasted wheels that were overwhelmingly fruity, we tasted wheels that had a distinctly “broccoli-ish” flavor, if my tasting notes are to be believed. Each subsequent tasting helped us to narrow it down and finally we honed in on a favorite. A perfect balance of nutty and fruity, salty and sweet, savory and umami. 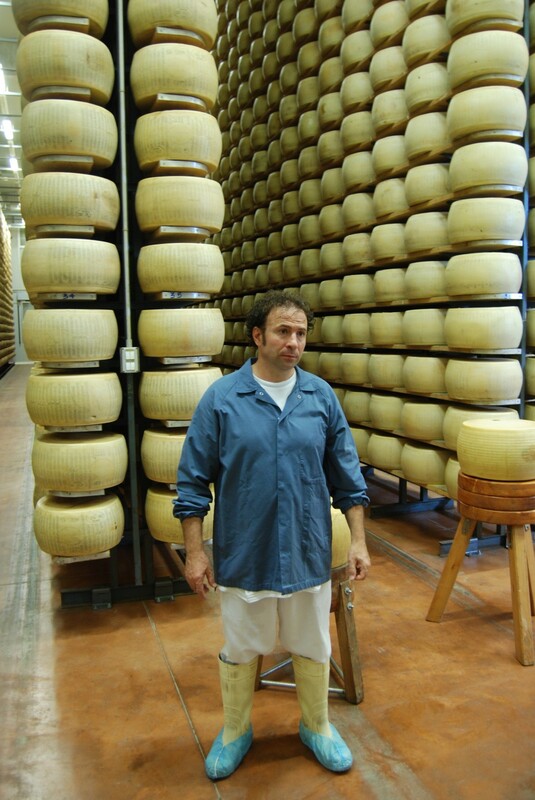 Then we reached out to the farm, we locked in the entire production, and we had Murray’s Parmigiano Reggiano. 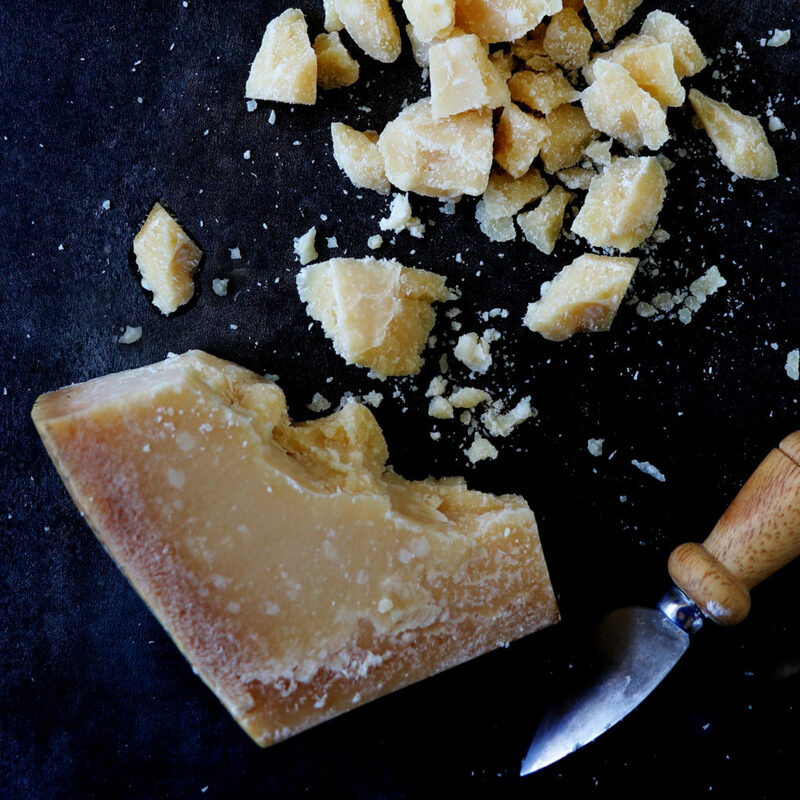 For a cheesemonger, the first time you crack open a wheel of Parmigiano Reggiano is always a memorable experience. I remember my first perfectly. I was helping to train some new cheesemongers in Cincinnati and was told to show them how to crack open Parm. No problem! But the beautiful thing about cracking a wheel of Parm happens every single time one gets opened up. 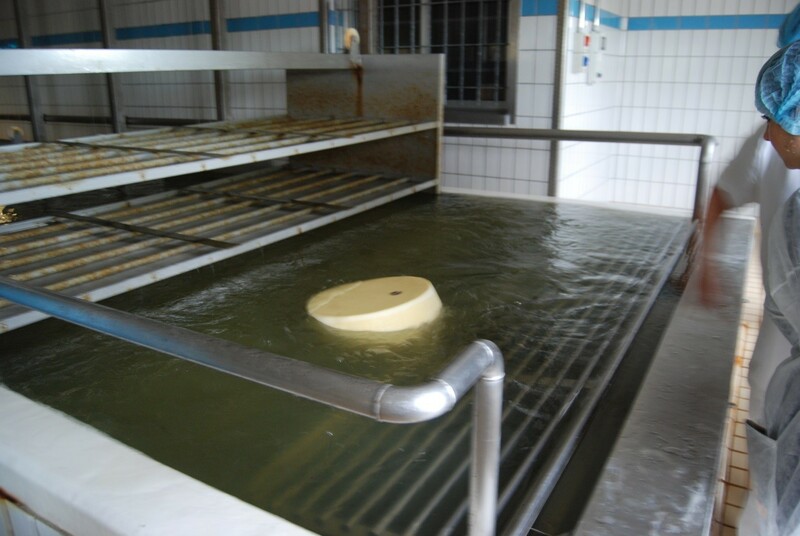 Milk, at most 14-16 hours old goes through the cheese making process, and once that wheel is put into its mold, the milk on the inside begins a two-year long journey. 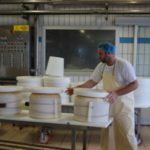 When a cheesemonger cracks a wheel, that milk is seeing the light of day for the first time in over 730 days. 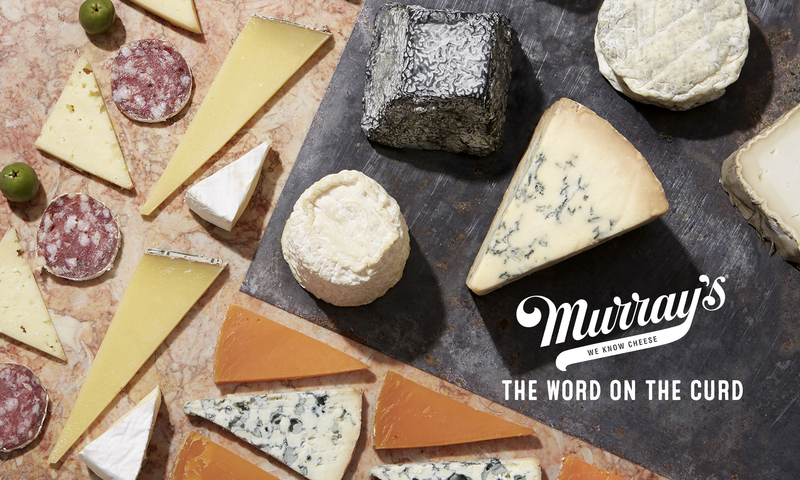 It is a beautiful and delicious moment and one that you can experience at Murray’s stores around the country this Saturday, October 3rd. 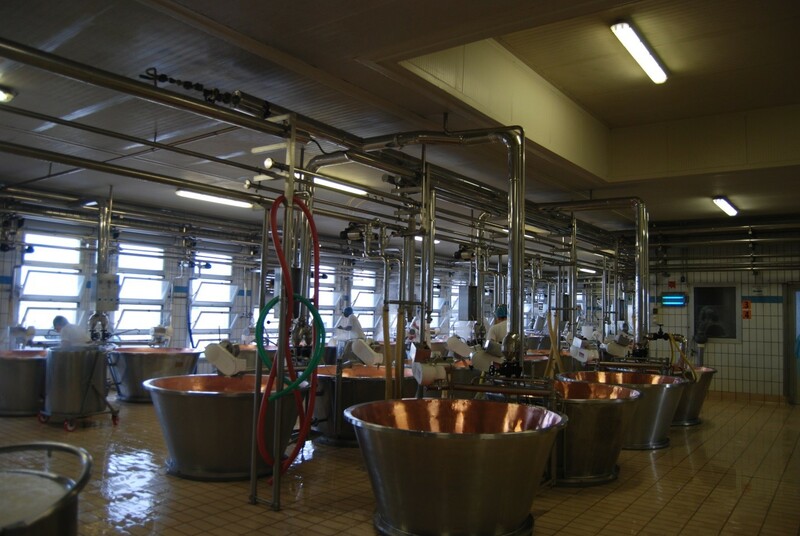 And finally, we’re walking in to the cheese making room where our Parm is made. I’ve cracked many wheels of Parm, but this was going to be my first time seeing that milk in liquid form. 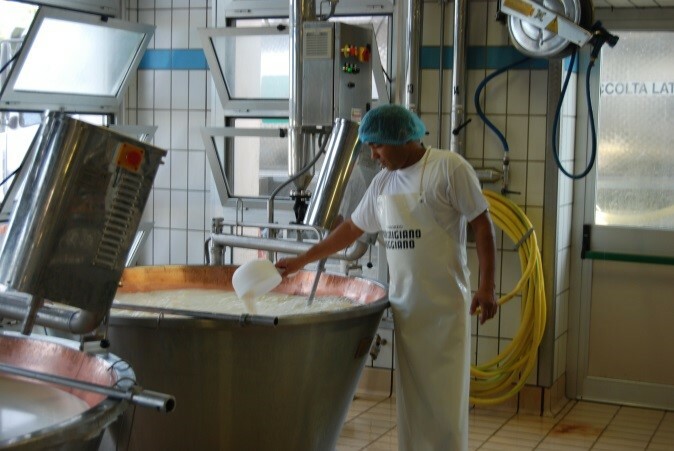 The first room we walked into, the cheese making room, was hot and humid and bustling with activity. We walked through and into the refrigerated milk room, where the milk comes in each evening to sit and await the morning milk the next day. All of the activity and heat of the make room are left behind as the milk quietly and peacefully enjoys the views. 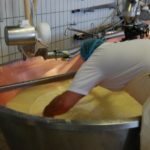 Back into the humidity and heat, and we got to meet Riccio and watch him and his team make Parmigiano Reggiano. 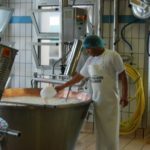 From heating up the milk, to adding the rennet, to cutting the curds, to gathering the curds, to putting the curds into the forms and then pressing them, Riccio walked us through the whole process as he and his crew worked. After settling into their final shape, the wheels take a 20-day bath in a salt brine to help further reduce internal moisture and bring the saltiness of the cheese up to the levels that we know and love. And then, they wait. And 2 years later, you get shelves and shelves full of the King of Cheese with our dynamic cheese maker!